Workshops focuses on Meditation and Inquiry as a path to Presence. 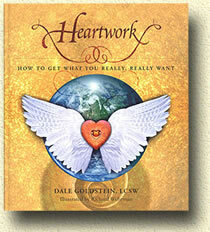 Fee: $175 for a Day of Heartwork, $275 for a Weekend of Heartwork. Discount: $50 off if registered at least 30 days in advance. Email awakentheheart@gmail.com to request an application. Retreat in your own space for 24-48 hours, joining Dale and other participants via conference call. Retreat begins at 7 pm ET on a Friday and ends 48 hours later. Date in 2019: June 7-9, 2019. Email: awakentheheart@gmail.com to request an application. The primary Heartwork tools of meditation and inquiry, along with unwinding, circular breathing, dancing, group discussion and individual instruction, help us surrender into our deepest yearning – the path back to our True Nature. Email awakentheheart@gmail.com to request applications. Our on-going Inner Work groups use meditation, inquiry and group discussion, as well as one-on-one work with Dale, in order to help participants deepen their inner work. Meets: About every other week, based on the availability of participants, for three months. Groups: One meets in Dale’s office, and one meets via teleconference. Work-study positions are available for all events. Email awakentheheart@gmail.com for more information and to request an application.